No two diamonds are created equal. 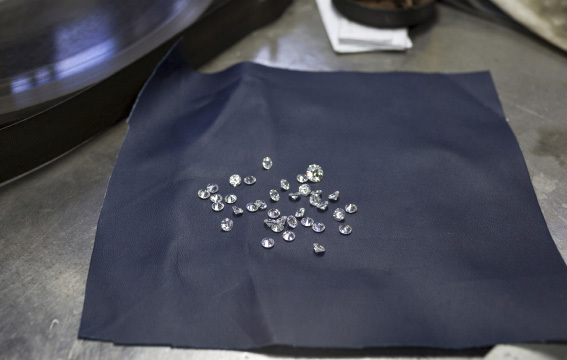 This is because there is a multitude of cutting options, clarity and color grades, as well as other defining characteristics that play a role in a diamond’s value. Often times diamonds that have been handed down through generations, or were purchased many many years ago, are not up to traditional modern standards. This is a result of the evolution in diamond cutting, and a cutter’s new ability to maximize the angles of a diamond to result in extraordinary brilliance. Most of these older style diamonds are being re-cut to modern standards to maximize their value. Other times diamonds can show wear, such as scratches, abrasions, or nicks. These surface characteristics can often detract from the brilliance of the diamond, and thus result in a lower re-sale amount. In this case the diamond can be polished to remove the surface blemishes and restore the diamond to its intended beauty. Diamond cutting and polishing is an extremely skilled craft that takes a well-trained, seasoned cutter to perform. MJ Gabel only works with cutters who have decades of diamond cutting under their belt, and are more than seasoned in the profession. In order to provide our clients a comprehensive and complete experience, MJ Gabel provides our own cutting and polishing services. The possibility of having a diamond re-cut or polished is only explored if it could increase the diamond’s value. As with every other aspect of our business, the ultimate decision will rest with each client. The owners are very honest and forthcoming regarding the sale of my diamond. I highly recommend this establishment and felt they dealt more than fairly with me during the entire process. Ask questions! Don’t be afraid to ask a company any question you might have – even if it seems silly!